One of the most enduring climate change denier myths is that in the 70s the scientific consensus predicted global cooling. Despite the fact that the authors who originally published such studies quickly realized that they overestimated the cooling effect from aerosols, and underestimated the warming effect of greenhouse gases, deniers claim that because the science was wrong in the past, it cannot be trusted in the present (can you imagine if we actually applied that standard to the real world?). Unfortunately for those uninterested in an honest look at the issue, this claim is demonstrably wrong. 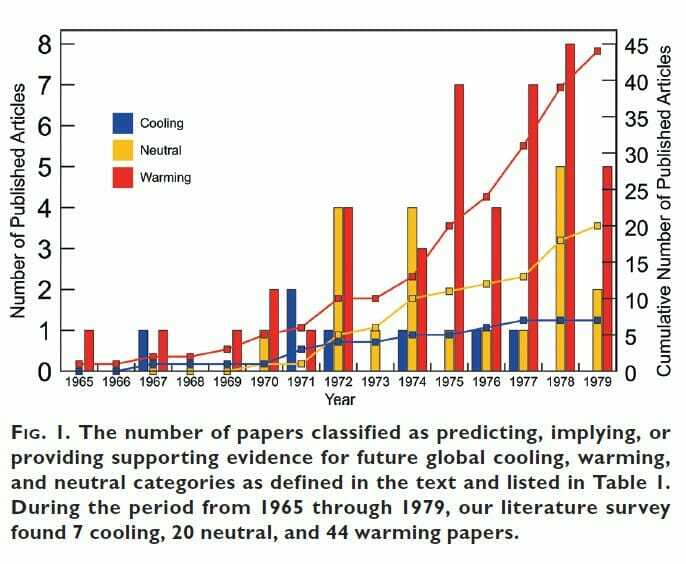 A new literature review of climatology papers from 1965 to 1979 published in BAMS (I first wrote about it here) shows that even at the height of the global cooling ‘consensus’ far more papers predicted warming than cooling. Of course this is nothing new, but deniers have a way of ignoring massive amounts of studies so I suspect that this myth will live on. How much does the loss of biodiversity cost? I have heard that word used allot by the “sky is falling” scientist who might imagine there is some “consensus” among GHG caused global warming believers. “Global Warming” may be occurring but only idiots or outright liars imagine there is any “consensus” for its cause. Most intelligent science has shown that activity of the sun is a more plausible and likely cause. Obviously ScruffyDan is the real denier or an idiot or an outright liar? As usual blanks, you fail to even attempt to talk about the point of the post, instead you prefer to spout talking points devoid of content. In fact the only point you make (wrongly), is about climate change being caused by the sun. Sorry blanks but there is plenty of published research that directly contradicts that. Oh and as for the ‘consensus’, it is supported by the IPCC the National Academies of Science from Australia, Belgium, Brazil, Canada, the Caribbean, China, France, Germany, India, Indonesia, Ireland, Italy, Japan, Malaysia, Mexico, New Zealand, Russia, South Africa, Sweden, the United Kingdom and the USA, the American Meteorological Society, American Geophysical Union, the American Association for the Advancement of Science, the Geological Society of London, the Geological Society of America, the Canadian Meteorological and Oceanographic Society, thousands of peer-reviewed journals, and even the American Association of Petroleum Geologists, all agree with the climate change consensus. In fact no scientific body of national or international standing is known to reject the basic findings of the human influence on the recent climate. How’s that for consensus? And one more thing, I have given you plenty of leeway in regards to the comment policy (and your complete disregard for it). I will no longer allow you to post off-topic comments that violate the policy. If you have something relevant to say, you are more than welcome to post it, otherwise it simply wont appear on this site.